I've decided to build a garden pond, and began thoroughly choose the future pond location. We knew that the pond should not be placed in close proximity to any medium trees. In that case their roots would damage the pond liner, aquatic plants would be shaded, and the falling leaves would fall into the water. On the other hand we didn’t want to put a pond and plants to direct sunlight for more than 6 hours per day, and chose a pond location in 10 m from the medium birch tree. Now, after years, I realized that it had to be placed further away from the birch tree, its leaves and flowers clog up the pond. The fastest way to build a garden pond is to buy a ready-made reservoir. They come in different shapes and sizes. We looked at the neighbors’ ready-made pond and realized that it does not suit us. My family and I decided to make a pond of such size and shape, as we like. A pond depth was made 60 cm + 10 cm for the layer of sand in order to save PVC pond liner from being damaged. A pond liner is made of different materials; you can choose the width, thickness and color. The selected pond liner was placed and cut at a height of about 20 cm above the ground, and its edges were closed with sand and turf. Shores were made even, because they must have the same height. 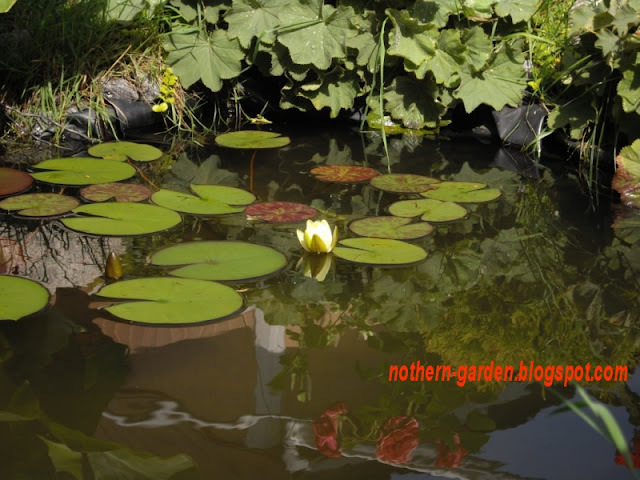 Water lilies (Nymphaea) are usually planted in mid-May to late June. Our first Nymph was planted in a basket. It was only necessary to wire basket and put stones on a top. The immersion depth was initially small, 10-15 cm, to the length of the Nymph leaves. The Nymph was dipping as its leaves were grown, and eventually turned out at the pond bottom. The first water lily flowered at once, as it was put into a special substrate in the nursery. Lily fully blooms in a year after planting. 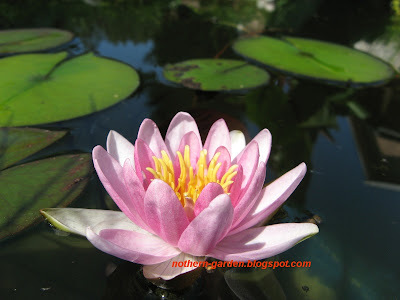 Now we have a few pond lilies, they bloom almost from July to late August, until the water gets cold. After two years, I made the ledges in the pond wall under the water surface. One was made at the depth of 25 cm for the water pump that supplies water to a small brook. I’ve chosen a safe pump, with 12-volt step-down transformer, which is set on the shore. The second shallow terrace was made for loving Cannes; only a bottom of their flowerpot was in water. And my Cannes put their roots out through flowerpot holes directly into the pond. There are seasonal procedures we do to our pond. 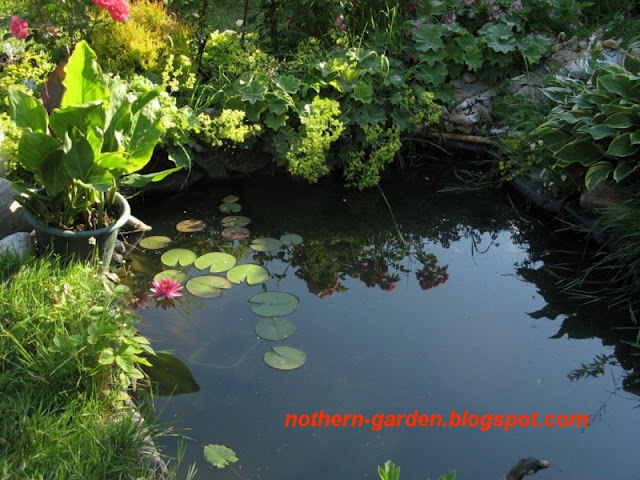 Regular pond maintenance ensures the life of the pond. 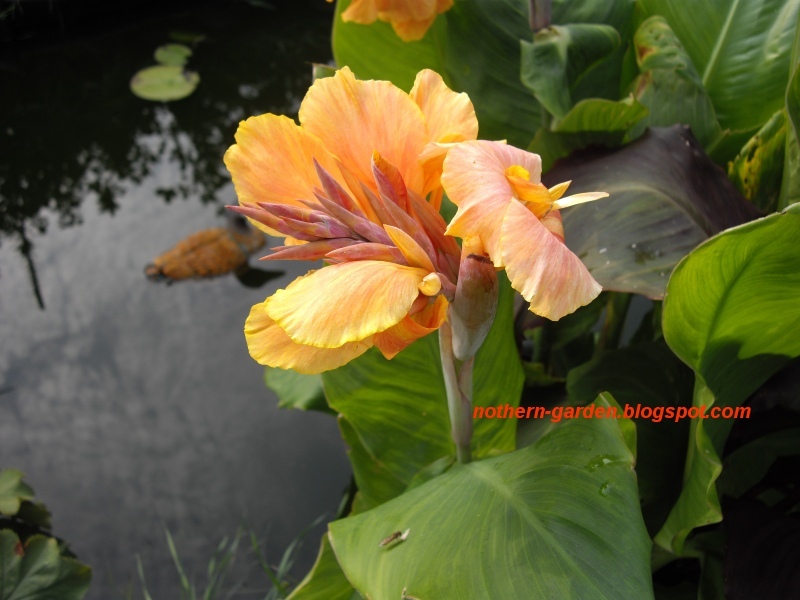 The better treatment of plants gives us a much better chance of clear, balanced water. Spring pond maintenance includes checking the water level; gently cleaning the pond bottom up the dead plants and animals remains. We remove slime and algae, catch the garbage. In the summer time the water level falls, we usually pour out rain water to the pond, adding water in intervals to prevent the temperature or the balance of the water from changing at once. We rid of bad algae and blanket weed, monitor the quality of water, its smell. 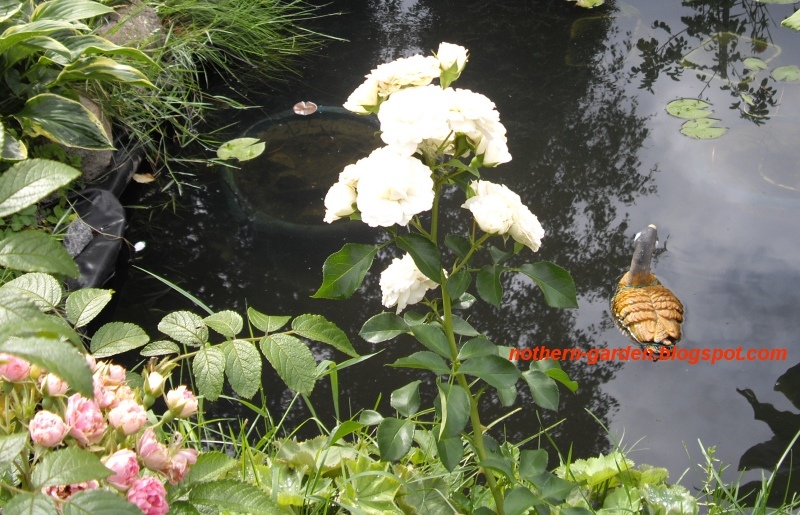 Cloudy water is normal in the summer, at higher temperature water plants begin to grow rapidly. Some gardeners advise to use birch broom to clean the pond. I don’t know, I always rely on special preparations. In the fall I try to keep the pond as leaf-free as I can. To avoid getting the leaves from the surface to the pond bottom we stretch a mesh. A mesh is anchored with stones and gravel. I suppose our hard work was not wasted, the pond actually got an ornamental and pleasant garden place, where the quiet brook gurgles. Yeah, it may take effort to build and maintain a beautiful pond, but all of the tiredness will disappear once you've seen the results. The prettiest of all the flowers in your pond is your water lilies, especially the pink ones. When they bloom, their colors become more vivid. Thank you, Jeleryl! I love water lilies too. A threads talking about it, fantastic. Lucy, the threads are interesting, I agree. Thank you! By following these tips any one can create a beautiful garden. I am fond of gardening and water feature. 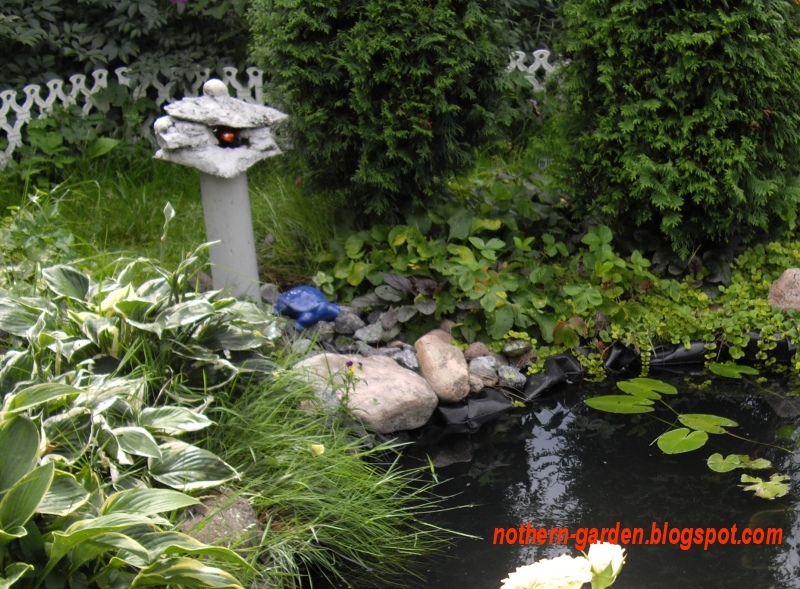 Recently, I installed little pond and made it waterproof by applying EPDM Pond Liner Repair.